Itay Gill is a Krav Maga, counter terror, security and aviation security expert with experience as an operative, instructor and consultant for one of the top special forces units in the world the “Yamam”. He is Founder and Director of Protect Krav Maga. 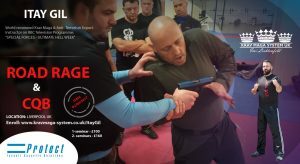 The world’s most reality and battle tested Krav Maga organisation, specialising in performance under pressure and reality based scenario training for self defence, security and combat situations. During his career he has personally trained the security teams for the Israeli and Ukrainian Presidents. The mayor of Las Vegas, HRT, FBI, SWAT, BOBE Brazil Special Unit Police, Royal Military Police Netherlands, FSB, Spetsnaz Alpha Group, Police in Scotland, Belgium, UK, Argentina, Ukrainian Airlines and US Airways, among many others. In 1997 he created an in-flight cabin crew training course, the first of its kind and today called “unruly passenger” by the aviation industry. He featured on the History Channel’s “Human Weapon” Series and hosted episode 2 of the BBC Special Forces “Ultimate Hell Week” 2015. Now we are honoured to be hosting two seminars run by Itay Gil in Liverpool in 2nd April 2017. This is your best opportunity to learn first class physical and psychological skills that will protect yourself and your loved ones. Places are limited to ensure quality of training so please reserve your place NOW below.